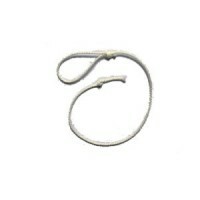 Fibreglass core, braided cotton cover and lash with excellent balance. 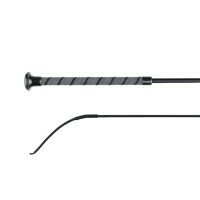 Colour: Black Size:..
Popular whip made of plastic. 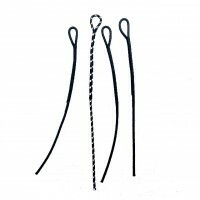 Black 65cm ..
Standard 75cm black plain braided crop with wrist loop and flat loop flapper is suitable f..
A plain braided brass ferrule deluxe crop that has a loop flapper. Class and elegance..
Black crop with silver ferrule and stunning imitation diamonds. 75cm .. 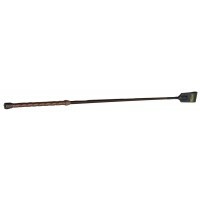 Riding crop with slim handle. Decorative crystal stones on the handle. Synthetic leather flap. Pink ..
A great value-for-money general purpose whip. 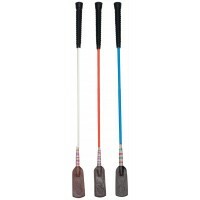 It features a foam handle for added comfort and good g..
Ultra-flexible braided shaft with matching multi-colour glitter thread interwoven. All whips f.. 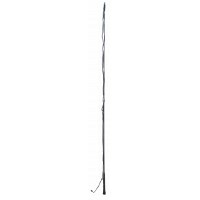 Ideal crop for little kids or even Show Jumpers at 60cm in length. Great colours and a chrome top to.. 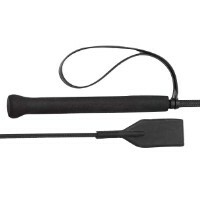 Braided shaft with leather grip handle and closed flapper. 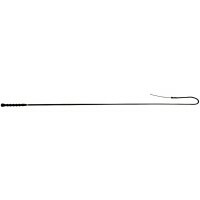 Available in Black or Brown 65c..
Black crop 75cm long with a sturdy pimple grip, wrist strap and open flapper. 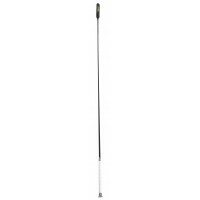 Is most popular ..
A great, basic riding crop, popular for Pony Club and general riding. It features a textured PVC han.. 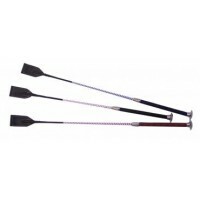 This crop is popular for Pony Club and general riding. 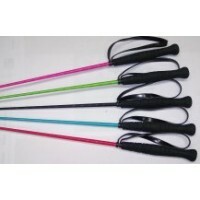 The shaped foam handle offers excellent grip ..
A fun and colourful rainbow whip, suitable for everyday riding. 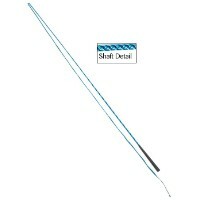 It features a braided shaft, covered.. Absolutely stunning solid colour crop with entwined multi coloured sparkle threads. 75cm..
Spiral coloured jewelled handle crop. 65cm.. Comfortable handle with excellent grip and wrist loop. Black 65cm ..
Trendy colour crops with grip, wrist loop and firm handle in fantastic colours. 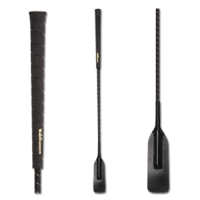 Open flapper.&n..
High quality jumping bat, featuring a special handle, light weight fibre glass core and broad leathe.. 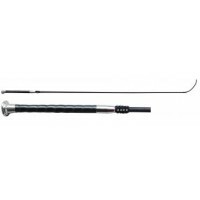 Lined covered shaft, leather wrap handle and flapper end. 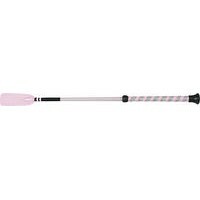 Black with White Handle 110cm&nb.. Flexible fibreglass covered with linen thread. 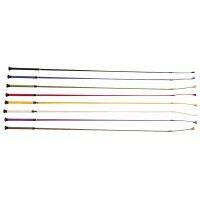 Available Colours: Red, White or Yellow 100cm..
Fibreglass criss cross shaft with smooth foam rubber handle, gold ferrule and cap. 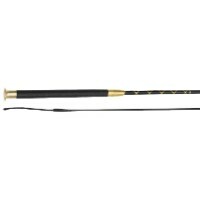 Black - 100c..
Fibreglass criss cross shaft with smooth foam rubber handle, gold ferrule and cap. 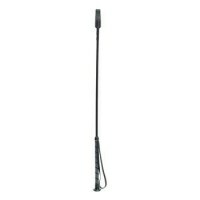 Black - 120c..
Dressage whip with clip on lash and wrist strap so you won't drop it. Black 100cm.. Comfortable handle with good grip. 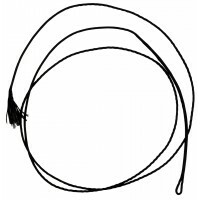 String lash. 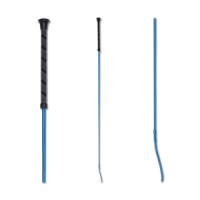 Black 110cm, 120cm..
Azure Blue anti-slip dressage whip Sturdy dressage whip with a sure-grip, rubber covered handle.&nb..
Black anti-slip dressage whip. 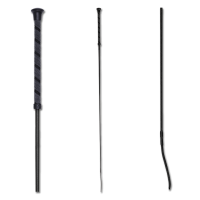 Sturdy dressage whip with a sure-grip, rubber covered handle Sizes:..
Lilac anti-slip dressage whip Sturdy dressage whip with a sure-grip, rubber covered handle. 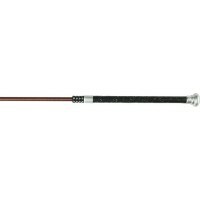 ..
Dressage whip with decorative clear crystal stones on the shaft and leather handle. 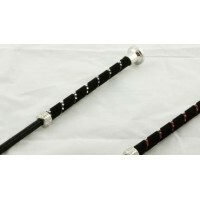 Black 100cm..
Dressage whip with decorative clear crystal stones on the shaft. 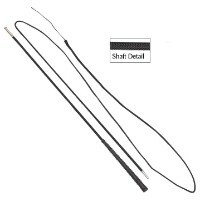 Black 110cm..
Deluxe dressage whip in 2 styles - White handle with Silver ferrules or Black with Brass. 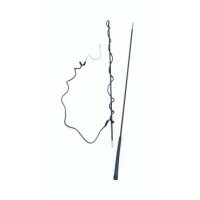 ..
A low cost harness racing swish whip, with braided shaft and rubber pimple grip handle. This whip al.. 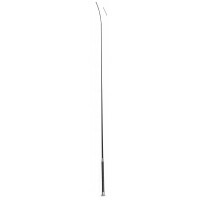 The perfect length for Pony dressage, in hand or general training dressage whip. 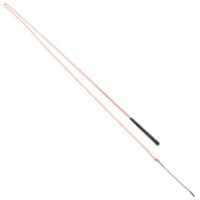 70cms total length .. 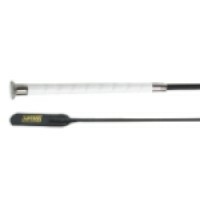 Lined wrapped shaft with leather grip handle, Silver ferrule and cap. Black 105cm.. Developed by Willy Schultheis, the famous and successful dressage rider & trainer. 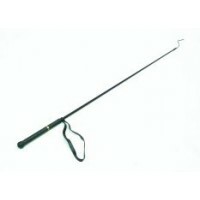 This dressage..
Black with rubber grip handle 120cm.. 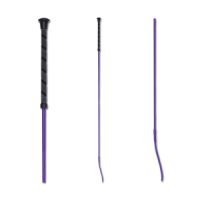 Ideal for training horses in-hand or as a yard whip. 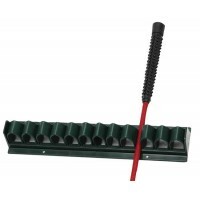 The fibreglass core withstands hard use and abu.. 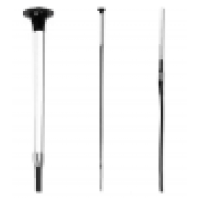 The longest whip at 200cm is detachable in the centre for easy tranportation & storage. 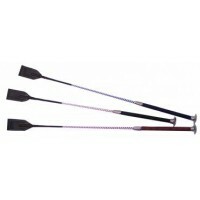 Black wi..
6Ft (180cm) long, is detachable in the centre for easy tranportation & storage and has a 6Ft swi..
Great strong and sturdy lunge whip with long lash. Fully braided in great colour with blac.. The purpose of the lunge whip is to act as an extension of the hand, pushing the horse from behind i.. 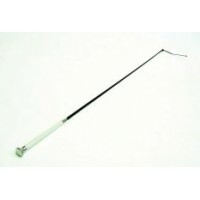 The extender is easily fitted to any lunge whip and adds over a metre to the overall length of the w.. 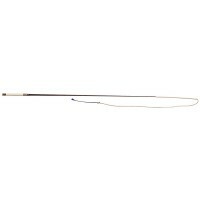 Single whip cracker replacement for stockwhip. .. 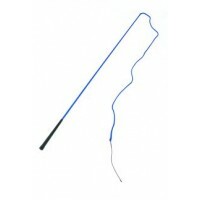 Single whip cracker replacement for stockwhip. White ..
A generously padded whip with a fine grip. 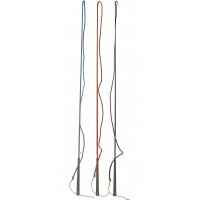 This whip is made to comply with the rules of the Austral..
Wall mounted to store whips. Holds 13. Black plastic.. This whip is virtually unbreakable! Extremely flexible. Colour: Black 80cm ..